Two family members separated by the border embrace at the international line between Sunland Park, New Mexico and Anapra, Ciudad Juárez as a Border Patrol agent looks on. The sixth Hugs Not Walls event brought 230 family members together for a three-minute hug on Saturday. Photo by Patrick Timmons/UPI. Under the Chihuahuan desert's cloudy sky just outside the border metropolis of El Paso/Ciudad Juárez, 230 immigrant families separated by the border came together Saturday for a brief, three minute embrace across the international line. Under the watchful eyes of U.S. Border Patrol and Mexico's Federal Police, the sixth "Hugs not Walls" binational family reunion, organized by El Paso's Border Network for Human Rights (BNHR), took place at a gate at the 18-feet high border wall dividing Sunland Park, N.M., from Anapra, Ciudad Juarez. "We are calling to reform the immigration system. We cannot allow family separation be the value we are about as Americans," said Fernando García, the executive director and founder of the BNHR. Families began waiting near the Sunland Park area of the border opposite Anapra in Mexico at 7 a.m. Saturday. Just before Border Patrol agents opened the gate, families on both sides of the border lined up neatly along the line of towering steel fence posts. "This wall behind us, and the fact that we will only have a few minutes for physical contact, is a reminder of the failure of our immigration system and laws that keep families separated," Linda Rivas said at a news conference in front of the locked gate in the border wall. Rivas is the managing attorney at Las Americas Immigrant Advocacy Center, an El Paso-based organization serving low-income immigrants. At 9 a.m., Border Patrol agents unlocked the 18-feet high gate, allowing 1,500 family members on the U.S. side to step beyond the fence into Mexico to embrace a similar number on the Mexican side. 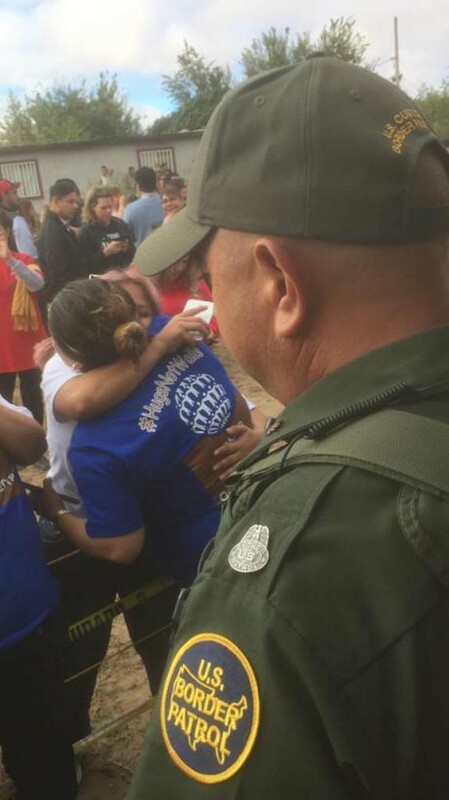 When organizers called their number, the U.S. family went through the gate to hug their Mexican family members. U.S. participants wore blue T-shirts, with Mexican family members wearing white. Several generations of family members were present, including babies and toddlers. The gate would remain open until noon, BNHR's García said, at which point Border Patrol would lock the gate to end Hugs not Walls. Many of the reunited family members had not seen each other for years and made lengthy journeys in Mexico and the United States to meet up at the border gate. Norma Medina is originally from Ciudad Juárez but now lives in Denver, Colo. Medina had not seen her brother, Agustin Medina and her nephews in nine years. She registered for Hugs not Walls a month ago and left Denver Thursday to make sure they arrived on time. "They used to live in the U.S.," Norma said, "but my brother was deported and they all went to live in Juárez. I am so thankful they allow this event to happen. I wouldn't be able to see my brother and his family without Hugs not Walls." The previous five editions of Hugs not Walls used to take place in the canalized river in downtown El Paso, not in New Mexico. But about three weeks ago Border Patrol canceled it when construction work began on the border wall at the location in the river used by Hugs not Walls. Carlos Spector, an attorney specializing in political asylum cases, told UPI the cancellation provoked a reaction from the community and the demand Hugs not Walls to continue as scheduled. Border Patrol responded by offering the alternative location at a place in the desert divided by the tall steel bollards, Spector said. "I've attended Hugs not Walls five times and it always makes me emotional," Spector said. The BNHR's García thanked the Border Patrol for working with the binational community to make Hugs not Walls possible. "We have developed a very substantive engagement and model here in El Paso and New Mexico where Border Patrol and communities are working together," García said. "The nature of El Paso, New Mexico and Juárez is one of collaboration and engagement." Immigrant families expressed gratitude for continuing with Hugs not Walls. "I haven't seen my daughter and three granddaughters since I fled Mexico seven years ago," Rosa María Vásquez said, just after finishing their three minute embrace. Vasquez, who is originally from the state of Chihuahua, drove from Albuquerque, where she now lives in exile. Vásquez told UPI she fled Ciudad Juárez in October 2011 when her two sons were killed, her voice falling to a hushed tone when she said the police murdered them. Vásquez seeks political asylum and fears returning to Mexico. Her family who still live in Mexico do not have visas to enter the United States, making Hugs not Walls a rare and unique emotional experience. With tears falling from her eyes, Vásquez said, "I was overwhelmed with nostalgia. I swore I wouldn't cry but I was hugging them and feeling like I did not want this to end. It's a beautiful event, it makes us feel together."